We patiently wait for our air transportation in the parking lot of the Grizzly Lake trail head, entrance to Tombstone Territorial park back-country. As I scan the horizon I hope to see a yellow craft sporting the name “Trans North Helicopters” emerge from the low cloud cover any second now….to no avail nothing. Seconds feel like hours and minutes feel like an eternity. We’ve taken all precautions we need “just in case” we can’t fly in and meet up with the other half of our expedition mates, but we’re also hoping not to have to use it. 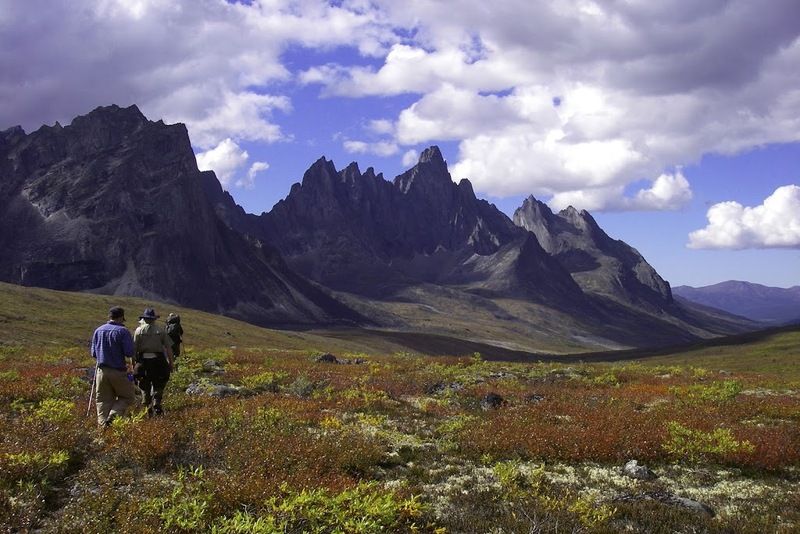 We are headed into one of the most stunning areas the Yukon has to offer, the Tombstone Mountains. 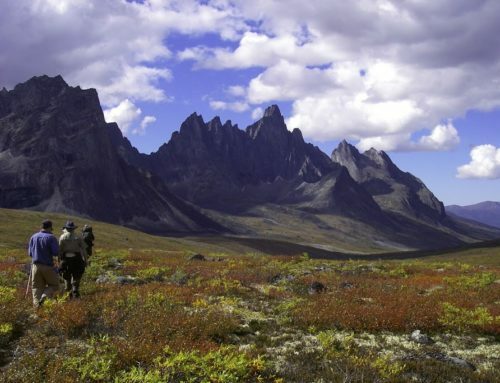 Situated approximately 75km NE of Dawson City, Tombstone Territorial Park is teaming with colors of the coming autumn. A palate of crimson, gold, green and orange set fire to the hillsides of the Dempster Highway – this is the finest time to visit this northern region also known as the “Patagonia of the North”. 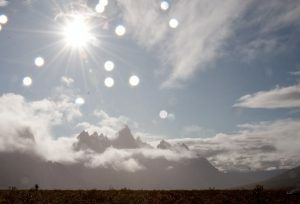 Memorable for its black granite peaks, idyllic alpine lakes and subarctic tundra landscapes, Tombstone Territorial Park is an icon among Yukon destinations. It is a place where the silence is so loud it is deafening, a place where the only sound you hear is the breath coming from your own body. Finally we hear the whoomp whoomp whoomp sound of the rotors as Steve our pilot makes a safe landing. After a safety briefing we are whisked away in a metal box along side the hillsides of the entryway to the Tombstone mountain ranges. The frozen white substance that paints their tops brings anxiety to us all….what will the weather bring to us in the following week? “We are lucky we can fly at all today” Steve enlightens us on the way in. “I hope you don’t mind, we’ll have to take the long way into the park.” My adrenalin wants to be excited about the longer flight but my weak stomach isn’t on that same train of thought. The familiar sight of Talus Lake’s tiny wooden tent pad sights and first sight at the other half of our group puts my stomach at ease, that was until Steve cranks the chopper to what feels like completely sideways in order to circle in for landing – I wish I could be as excited as everyone else with the bold move. We unload the chopper under the strong wash of the rotors and wait for Steve to lift off, fully committing us to being far away from any civilization or help. I’ll never forget the sound when the chopper finally lifted, then there was nothing. Absolutely nothing. Sound that was so silent it was deafening. The cloud cover remains low, giving us only a tease of what might be hiding behind them. After re-fueling on bagels and setting up camp we venture on a day hike towards the base of Tombstone Mountain. Its almost like swimming across a lake….always a bit further than it looks! We were able to locate the same grave site and remains of an old outfitters camp up on a hillside just out of Talus that we found the year before – its history is still a mystery. Have you crossed the WEST COAST TRAIL off your bucket list?